Sabbath Walk: But I am No Bonhoeffer! But I am No Bonhoeffer! TITLE: "BUT I AM NO BONHOEFFER!" Discipleship is not an easy feat. It is tough. It demands sacrifice and commitment. It requires courage. Our Lord Jesus has given us this mandate a long time ago. This verse has often been quoted at discipleship conferences, teaching moments, and pulpit sessions. Hard hitting, direct and frank, it is targeted not only at Peter, who had just confessed that Jesus is the Son of God, but for all of us. Confession begets motivation. Motivation demands action. It is relatively easy for us to confess Jesus as Lord. It is more difficult to be motivated to practice what we believe. It is even more difficult to live as if we are going to die. Why? "Don't worry, you have time." "Relax. Let others do the job. You have better things to do for yourself." "Why bother about the Great Commission? You've been saved right? If God is so mighty and powerful, surely He can save other people without involving small little you, right?" Wrong. 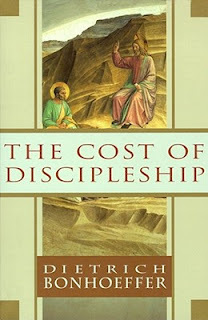 The call of discipleship is a calling to pay the cost of discipleship. Willingly. Gradually. Totally. There are three major impediments to any positive response to discipleship. This gives us a clue on what it takes to overcome inner fears. We need an inner strength that only the Holy Spirit can give. While we may not be a Bonhoeffer, remember that Jesus has promised us the Holy Spirit? Remember too that Jesus himself has said that greater things we can do? When we fear, we excuse the power of God for the pitiful strength of men. We have unwittingly exchanged the glory of the Immortal God with the images and idols of the material world. Merely reflecting on Bonhoeffer's inglorious death is enough to cause one to say, "I am no Bonhoeffer!" and we think we can deflect any responsibilities to follow Christ to the hilt. "But I am no Bonhoeffer!" We think that this alone can excuse us from further efforts to draw us away from our comfort zones. Mind you. We are all creatures of comfort. Wake us up from our warm beds and we become irritated. Make our lives a little more inconvenient and we become easily disgruntled. Prod us toward the right path that is narrow and thorny and we react aggressively why we cannot be left alone. "I am no Bonhoeffer! So don't you Bonhoeffer me!" An angry man is a man on the verge of sinning. It is easy to hit back at others who attempt to draw us out of our shell. It is plainly and simply uncomfortable, and we do not like it. So we blurt out a flare to try to distract others from holding on to us. We try to shake away the good intentions of others by claiming something that appears true on the outside but hides the truth of our inside. Easily said, and those of us who say it, believes it. Have you ever seen a fat soldier? The truth is this. Soldiers who are obese will lack the agility to shift positions or to take quick action to fight the enemy. If we use the words "I am no Bonhoeffer" as an excuse to keep feeding ourselves with our self-needs, it is easy to see that eventually, when we fail to live out our calling, we become a nobody. A popular maxim is this "Make peace, not war." This is the ideal state. After all, we are called to be peacemakers, especially when it comes to sharing love and goodwill. That said, that is something that we do toward fellow people. That is not something that the spiritual forces of darkness are going to let us do. Did the devil leave Jesus alone in the wilderness? No. The devil tempts Jesus. Not once, not twice, but three times. Did Paul had an easy time in the gospel? No. All evidence points to Paul having a tough time trying to reach the Gentiles. He even had a quarrel with fellow workers like Mark and Barnabas on how this is to be done. In case you are not aware, we are at war. Spiritual warfare is real. Why are we called soldiers? Why are we to put on the armour of God in Ephesians 6? Why are we to fight the good fight in Paul's epistle to Timothy? It is simply this: We are at war. People who refuse to acknowledge that there is a war will never take up arms. The trick the devil does is to make us think that we are not in a war. The words, "But I am no Bonhoeffer" is one example where we can easily shirk the responsibility of spiritual warfare, to hide our real motives behind some factual statement. Come next year, I will be leading a small group through Dietrich Bonhoeffer's classic work on discipleship, "The Cost of Discipleship." It is a no-holds-barred book that does not mince words. Bonhoeffer tells the cost of following Jesus as bluntly as he can, with his own life. Written amid a worsening WWII situation concerning Germany's threat to the neighbouring nations and beyond, it is also a book to rally the people of God right thing. In a call to pursue truth and faithfulness in God, Bonhoeffer ventures out valiantly at a great personal risk at a huge cost. He paid the cost the way that he himself has called others to. Just like Jesus. Those of us who can easily say, "But I am no Bonhoeffer" can also easily chime in that "But I am no Paul" or "But I am no Jesus" or "But I am no this saint or that saint." Pursuing this path of discipleship is not an easy feat. Already, I have heard individuals contributing their 'but' and their 'why.' I confess that I too am not keen on the book initially, simply because of the fear that the book may be deemed too challenging and may even turn away prospective attendees. That said, must truth be censored? Can we ever dilute the call to discipleship? Shall we even dare to diminish the uncomfortable call in favour of the comfortable topical studies about making us feeling nice inside but passive outside? Four words typify a response to any hard call to discipleship. Agree. There is only one Bonhoeffer. Disagree. That does not absolve us from the call to follow Christ. If we are aiming to imitate Bonhoeffer, we will have gotten it all wrong. We cannot miss the forest of following Christ for the tree of Bonhoeffer's life. It is not WWII now, but it sure is spiritual warfare that is ongoing and threatens our very growth as disciples of Jesus. Beware of these three threats. We fear threats to or comfortable lives. We fatten ourselves up with self-needs to the detriment of the Great Commission. We forget that we are at war. Perhaps, when we overcome these threats, we will not be saying "But I am no Bonhoeffer." Instead we will be saying, "Lord, help me to be the best disciple for You, and if it is your will, to live like Bonhoeffer lived, and to die like Bonhoeffer died." The bigger threat to our call to discipleship is not whether we could do this or we should do that. The bigger threat is whether we would. "Candle of Joy and Love"